This project, loosely modeled on Crystal Quilt (1987), was Lacy’s “re-thinking” of the earlier work. Rather than dealing with leadership and visibility, the project examined the beginnings of personal political commitment through the narratives offered by women in or influenced by activist movements from 1960 to 1985. Silver Action explored recent issues in British media around aging and, in addition, underscored a real public interest in past activist movements in the UK. In the midst of calls for budgetary austerity, support for the elderly—health care, housing and so on—was seen as a burden. Prior to the performance, women from the miner’s strike, disability, ecology and feminist movements participated in a series of work- shops. 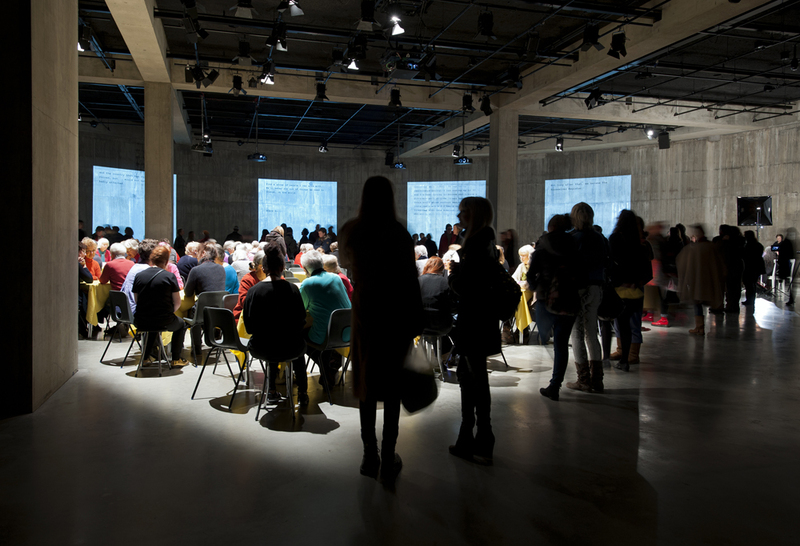 During the performance four hundred older women converged on The Tanks at Tate Modern for a live and unscripted performance of three tableaux. Throughout the five-hour performance, four sequential “acts,” one each hour, featured a hundred women at a time talking to each other at small tables. Simultaneously, their first experiences of activism were broadcast live on wall projections and in a twitter/social media campaign using the hashtag #silveraction. In another part of the room, four “kitchen-table” conversations by well-known activists were shot on video. The engagements between the older women contrasted sharply with the concrete walls of the industrial tank, framing a “sculpture” for an audience of 1000 people who wandered amidst the tableaux. Curated by Catherine Woods for The Tanks at Tate Modern and sponsored by the BMW Tate Live series. Vicky Carmichael, Anna Kapulika, Michele Fuirer and Capucine Perot produced the project, which was also supported by the Sisterhood and After, a project by Dr. Margaretta Jolly, Sussex University, the Gender Studies Institute of the Lon- don School of Economics, The Southbank Centre, Forster Communications, and the staff of Tate Learning. 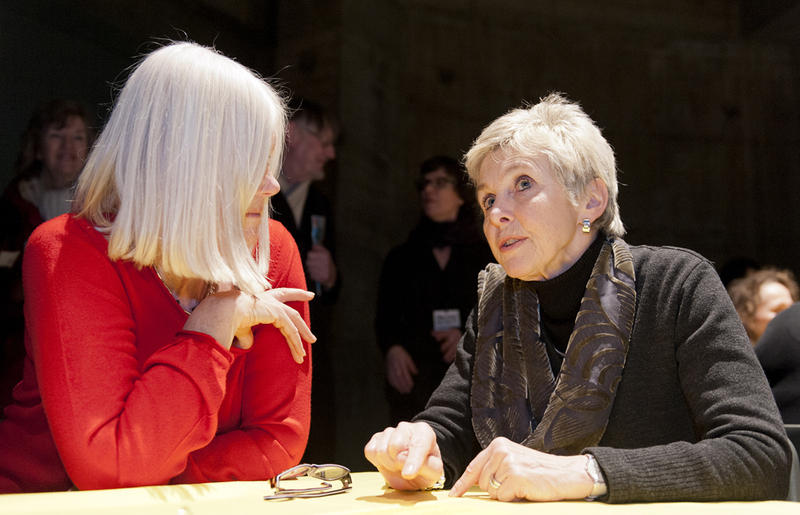 Four hundred women over the age of sixty converged on The Tanks at Tate Modern to participate in a participatory artwork, Silver Action, a live and unscripted performance of staged conversations. Women from across the UK who took part in significant activist movements and protests from the 1950s to 80s have been invited to share their personal stories in a series of workshops, culminating in this day-long public performance. 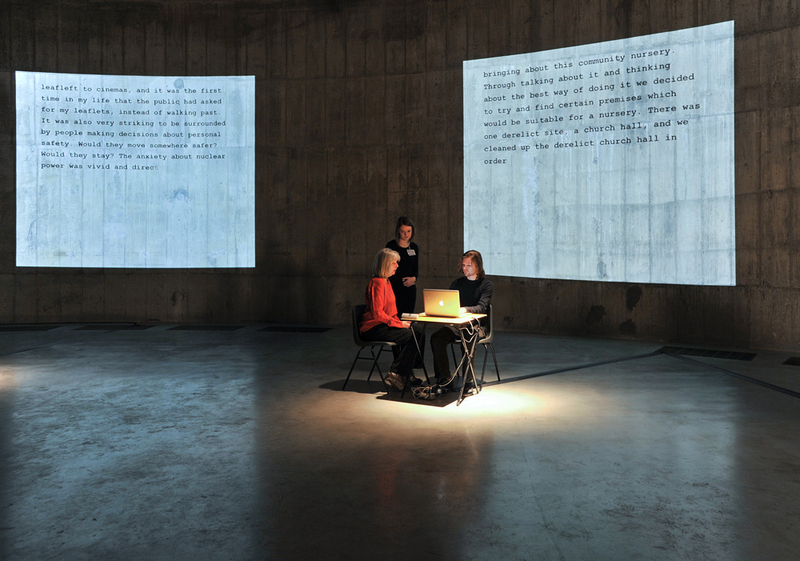 Diverse groups of women discussed their experiences and the impact and results of their actions and live documentation of the conversations – film, social media and text – will be projected on to the walls of The Tanks and out into the digital world through the Twitter tag #silveraction. Silver Action explored current themes in social and political discourse and the role of personal commitment in influencing the public agenda through the activist histories of British women, many of whom are now in, or entering, old age and facing new challenges. 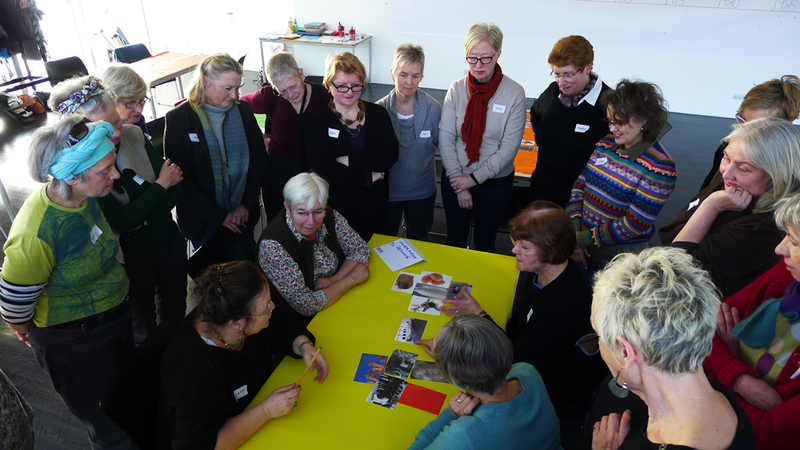 It champions the inclusion and social relevance of older women and offers new ways of looking at the ageing experience and the role of women in social transformation. A complete Artist Statement is available on the Tate Modern's website.